Currently browsing posts filed under "Katie Craig ’08"
Remembering Katie Craig ’08. I did not know that Katie’s father Rob Craig ’78 had also passed away. Previous coverage here. Condolences to all. For coverage of the tragic death of Katie Craig ’08, please see here. Our hearts go out to her family and friends. If you would like to share a memory of Katie, feel free to do so in the comments. Even small moments — a joke shared in the dining hall, a class project done together, a training run on a fall afternoon — will be meaningful in the years to come to those who knew Katie best. Few Eph hearts won’t weep to read these remembrances of Katie Craig ’08. Our daughter, Emma, met Katie when Katie led a marvelous backpacking trip designed for entering freshmen at Williams to get to know each other. Katie then welcomed Emma to spontaneous dances and social fun with friends. In those first weeks of college, we would often hear a happy Emma telling us that she was going to be seeing Katie later that day. Katie’s wonderful warmth and her delight in college life and the outdoors contributed hugely to Emma’s enjoyment of freshman year. As parents we are so grateful to Katie for her goodness and sense of joy. We grieve for Katie. 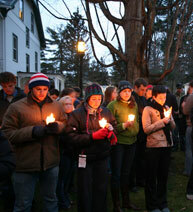 We grieve for Emma and for Katie’s other close friends at Williams College, who deeply mourn her. And we are inexpressibly sad for the tragic loss that Katie’s mother and brother have suffered. We send our heartfelt sympathies. Katie was everything an Eph ought to be. We all grieve today. If someone at the service could send us pictures or descriptions, we would be pleased to print them for all the Ephs who can not be there. Touching obituary for Katie Craig ’08 from her hometown paper. Katie Craig of Cumberland left us on April 5 during the most lovely snowstorm of the season. A student at Williams College and a graduate of Greely High School, Katie was a beautiful, creative and frisky spirit who brought joy and laughter to all who knew her. We watched in awe as Katie pursued her passions for art, Nordic skiing and the natural world with a talent and intensity that few could ever hope to match. Most importantly though, Katie’s life was anchored by a deep and reciprocated love for her family and many friends in Maine, England and beyond. She inspired us all and the hole she leaves in our hearts is impossible to describe. Wendy (Mom) and Will (brother) thank their wonderful family, friends and neighbors for such incredible support. We would like to share an excerpt from Katie’s favorite children’s book Our Animal Friends at Maple Hill Farm written by Alice and Martin Provensen. In a quiet corner of an overgrown field, the snow lies deepest and the oak trees hold their leaves all winter…Here, the best wild flowers grow and the first peepers are heard in the spring, even before the snow melts. Here, owls call from the treetops in the early morning and the irreverent crows hold their noisy conventions. Here, the mother deer has her fawn, and the migrating geese can rest. It is here that Katie and her father Robbie are at peace. It is here that we can visit them. As I mentioned yesterday, the Record provided substantial coverage on Katie Craig. The picture appeared on the front page of the paper. Here are some excerpts from the articles. Talented artist, accomplished skier, nature lover and beloved friend of many, Katie Craig ’08 passed away last Thursday morning. She was 20. 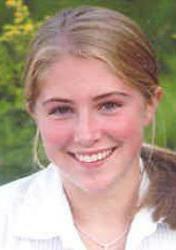 Katie Craig ’08 passed away on the property of her Cumberland, Maine, home last Thursday. Craig, who was away from the College on voluntary medical leave, had been diagnosed recently with bipolar disorder. Her death is considered a suicide, the circumstances of which have not been made public. Wendy Craig, Craig’s mother, said her daughter had been struggling with the illness during the months before her death, with the symptoms intensifying significantly in the weeks before Spring Break. A few days before the break, Craig took a voluntary medical leave from the College, after discussing her condition with Associate Dean Stephen Sneed. She left to pursue intensive treatment. According to her mother, Craig had not been receiving extended treatment or medication from the College’s Health Center. Adaptable and brilliant, she left us with so many different kinds of memories, in so many different parts of our lives. We remember dancing with her as a happy little penguin on Halloween at Sheep Hill. We remember bubble tea in the common room, fondue and backrubs. We remember sledding down mission hill on the ‘boggan. We remember farming in France. Katie Craig lived to make people happy. And in this, she accomplished more in her short time here than most of us could ever hope to. The word I have heard used most often in connection with Katie’s life is “light,” and I think she would be pleased with that idea, although, in her humility, she would never suggest it. Katie was a light for us all, bringing smiles and laughter equally to those of us who were fortunate enough to know her well and to those who only met her once. She glowed, and she made us all glow. To say that the Williams community was shocked at the passing of Katie Craig ’08 would be an understatement in the truest sense of the word. The outpouring of grief, condolences and remembrances shared at vigils, mountaintop services and informal meetings among friends speaks to her death’s impact on this campus. Amidst an almost palpable sense of communal heartache, we as journalists came to a challenging question: how much can, or should, these pages say? Nothing at all, some may argue, as issues of such gravity call for solemn, private reflection, not the reportings of student journalists. But as both students and journalists we would be remiss in our obligations should we chose this alternative – remiss, because as journalists we’re obliged to provide public record of significant events at the College; and remiss, because as students, we would be doing a tremendous disservice to a fellow classmate and friend in staying silent on her passing. All the articles are a good read, all the way through. Katie Craig sounds like just the kind of person I would have loved to know, spend time with, or just hang out around. I am sorry that I never even met her, and I think that those who did were very fortunate. They aren’t online yet, but the Record ran four great articles about Katie Craig in this week’s issue. I’ll post them when they become available, but I thought I’d summarize them for those who aren’t lucky enough to have a hard copy of the paper at their fingertips. The headline of this week’s paper is “Campus mourns passing of Katie Craig ’08.” There is a large color picture of the candlelight vigil, with students holding candles. There is an article below the picture that serves an obituary, with a picture of Katie and reminiscences by students, faculty, coaches and friends. The right side of the paper is an article headlined “Craig takes own life after battling Bipolar.” This is an article about the circumstances of Katie’s taking a leave of absence, her brief treatment and diagnosis, and her death almost immediately afterwards. Inside the paper, the Record board piece this week is entitled “On remembering Katie Craig ’08 in print.” It discusses the difficulty of what to do in such an event. As the editors say, “Amidst an almost palpable sense of communal heartache, we as journalists came to a challenging question: how much can, or should, these pages say?” They discuss the decision to run three articles covering different aspects of the event: an obituary, a news article about her illness and death, and an op-ed article by her friends. The piece deals well with this difficult topic, and should be read by anyone who is interested in the sensitive issues surrounding the death of a current and beloved student. As mentioned above, one of this week’s op-eds is written by two of Katie’s close friends, and is full of their memories of Katie. It includes a large picture of Katie with a group of eight friends, including the two writers of the piece, on Mountain Day this past fall atop Stony Ledge. We have just learned that Katie Craig’s memorial service is going to be held this Friday, April 13th at 3:00pm at the St. Mary the Virgin Episcopal Church in Falmouth (http://www.smary.org). We have arranged for bus transportation which will leave the Dennett side of Mission Park at 8:00am and will return from Falmouth at 7:00pm. I encourage students to consult their professors if you will be missing classes to attend the service. To ensure that we have enough seats, please reply to this message if you plan to ride the bus. Katherine Craig ’08, while home on leave from the College, took her life after a valiant battle with mental illness. Our deepest sympathies go to her friends and family at this sad time. Many here in the Williams family knew Katie as a warm, bright student, dedicated to environmental issues; underscored by her contract major in environmental science and ecology. She was an accomplished athlete–scoring regularly for our Division 1 Nordic ski team. A brilliant artist, she used her talents to deepen her appreciation of nature and to advance her advocacy for it. A painting of hers hangs in the office of the Center for Environmental Studies. She had recently achieved Honorable Mention in the Udall Scholar program, an honor given for commitment to a career in the environment, leadership potential, and academic achievement. Katie had all this and much more. She was beloved. Members of the campus community are understandably shocked and saddened. I encourage us all to be aware of who around us could use our support. We will pass on to you details of services or other arrangements when they are known. EphBlog is powered by WordPress and delivered to you in 0.937 seconds using 27 queries..